Restore and cleanse the Shrine of Saint Veloth. The Shrine of Saint Veloth has been desecrated by Magistrix Vox. This Daedric attack has left the spirit of Veloth in a weakened state. Travel to the Shrine of Saint Veloth. Gather the Reliquary Stones, Spire and Pendant. Find Saint Veloth's skull in the crypt. Magistrix Vox attacked the Shrine of Saint Veloth. Acolyte Gami at Selfora says Veloth's power seems to be fading. At the Shrine, you gather Reliquary Stones, the Reliquary Spire and the Reliquary Pendant. However, Master Aron says a daedroth took Saint Veloth's skull. Acolyte Hlen followed the daedroth to the western crypts. Follow the daedroth into the crypt and destroy it. The skull is behind the daedroth. Pick it up, climb the stairs and talk to the Vestige of Saint Veloth. He tells you to place the skull with the Reliquary pieces on the dais. Rebuilding the Reliquary restores Saint Veloth. He can protect you from Veloth's Judgment, the hammer Vox stole from the Tribunal. The hammer traps the souls of those it kills, and those souls feed Vox's power. Few survive its blows. Veloth gives you his blessing, which will stop you from being killed, but you will be sent to where the other souls are trapped. You need to free the souls to defeat Vox. Saint Veloth tells you to go to Eidolon's Hollow and defeat Magistrix Vox. A priest of Veloth claims the saint's fading spirit is expecting me. 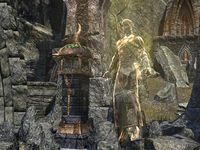 I should find the Vestige of Saint Veloth at the shrine entrance, on the stairs near the bridge to Tal'Deic Fortress. Finishes quest Vox weakened Saint Veloth by shattering his reliquary. I need to recover the pieces, scattered around the shrine, and bring them to Master Aron. I collected several pieces of Saint Veloth's Reliquary. I should find Master Aron at the top of the shrine and give the pieces to him. A daedroth carried off a holy relic, the Skull of Saint Veloth. I need to find Acolyte Hlen, who's been tracking the creature near the western crypts. Acolyte Hlen saw the daedroth carry Saint Veloth's Skull into the nearby crypt. I must enter the crypt to recover the holy relic. I recovered the holy relic from the daedroth. I should speak to the Vestige of Saint Veloth and find out what to do next. The reliquary can now be reassembled and Saint Veloth's powers can be restored. I must go back to the top of the shrine and repair the reliquary. The reliquary is whole again. I can see that Saint Veloth's spirit has also recovered. I should speak to him. Finishes quest I restored the Shrine of Saint Veloth and received his blessing. It's time to face Magistrix Vox at Eidolon's Hollow. This page was last modified on 14 April 2019, at 02:41.